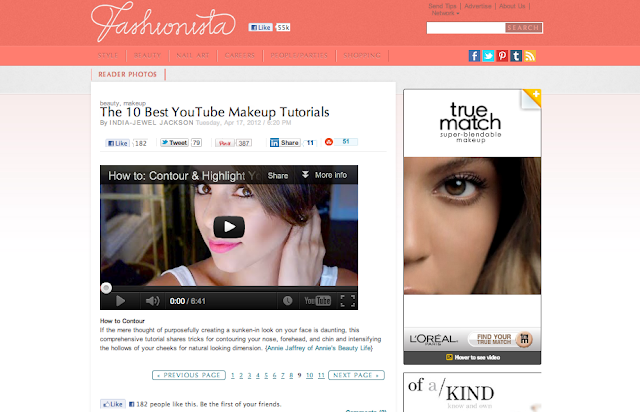 I am featured on the homepage of Fashionista today in "The 10 Best YouTube Makeup Tutorials"! Yay :) I had no idea until my friend texted me a few hours ago, I was totally shocked. Fashionista recently won the Best News Site at the 2012 Bloglovin' Awards here in NYC. All the ladies in the article are amazing so I am happy to be part of it! I am home now from a LONG but good day! Going to workout now to my Brazillian DVD and later having a little spa night, pedicure, hair mask, and a mini facial. I also just booked a hair appointment for Friday and I can't wait! I haven't cut my hair since August, that's 9 months (..a baby lol). So excited for a fresh cut! You are the best Annie :) Congratulations, you deserve it! What are you doing for your mini facial? Your channel is so full-scale, everyone's love it! Totally agree with Olivia's comment - well said!